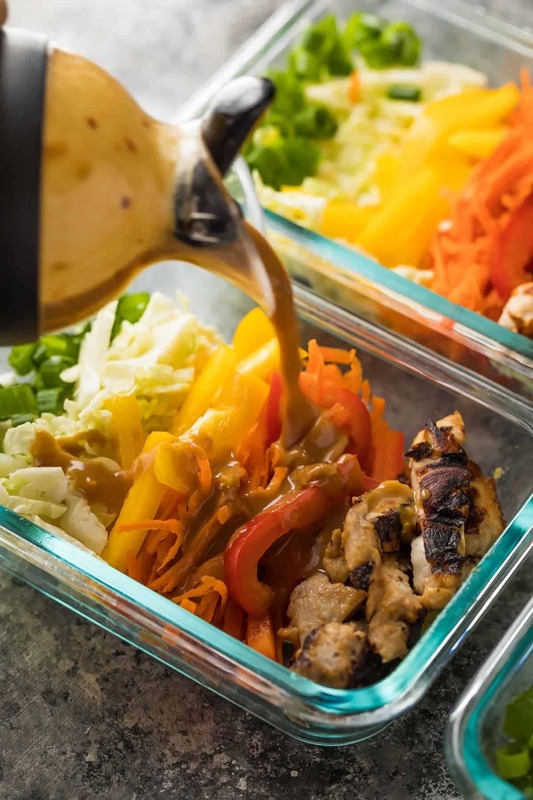 These satay chicken meal prep lunch bowls can be prepped on the weekend and enjoyed throughout the week for a tasty, low carb lunch. You’re going to want to drizzle that peanut sauce on everything! My parents used to have a dinner rule: you had to have three colors on your dinner plate and had to eat three different colors in order to get dessert. I seem to have adopted this rule and expanded with it, because hi my name is Denise and I like to eat a rainbow! 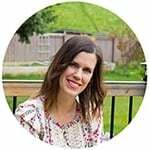 While it is true that ugly food can be some of the tastiest (just look at this Slow Cooker Sweet Potato Chicken Curry and this Mediterranean Chicken Quinoa Casserole for confirmation), I also think that rainbow food tastes darn delicious. 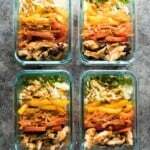 Today’s rainbow satay chicken meal prep lunch bowls are actually adapted from this Satay Chicken Salad recipe from waaaay back in 2014. It was one of our favorite summer recipes and I wanted to make a meal prep version of it! These satay chicken meal prep lunch bowls use chicken thighs, because I find they hold up better over four days than chicken breast. Step one? 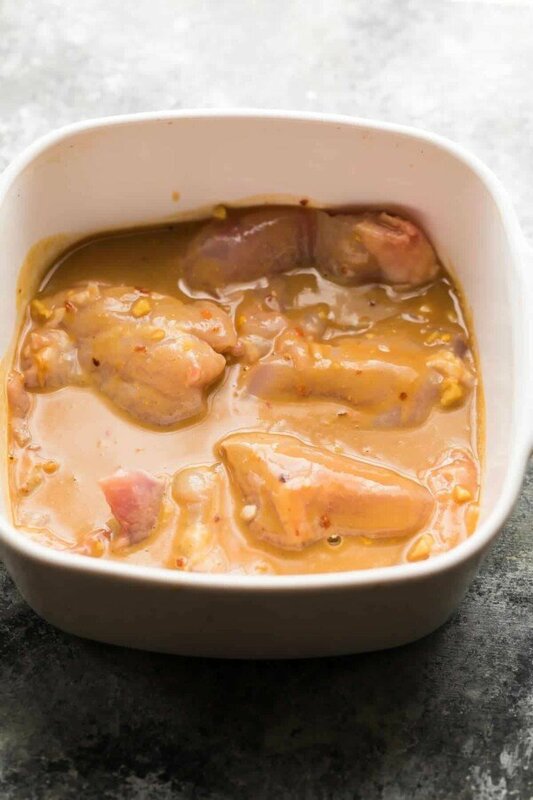 Get the chicken thighs in a satay sauce bath. The dressing for this recipe doubles as a marinade, so that means prep once use twice. Multitasking for the win! 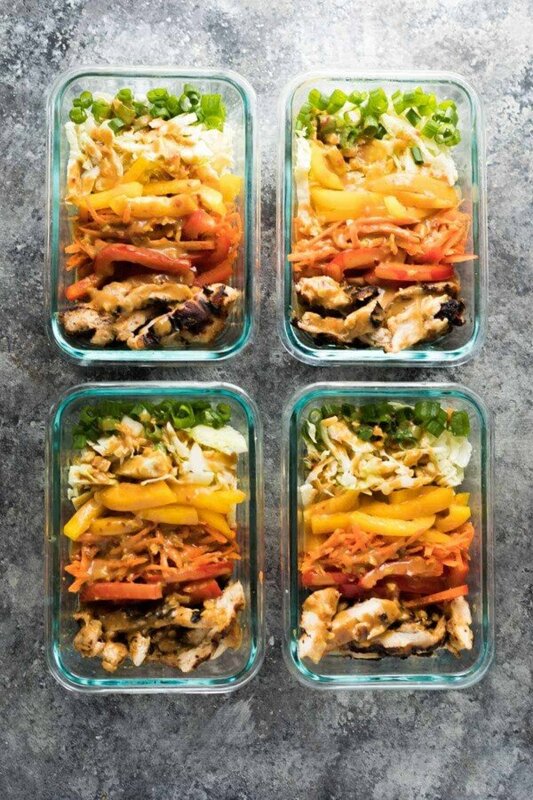 While your chicken marinates, get your veggies chopped: crunchy crunch crunch: cabbage, carrots and bell peppers. The original recipe had bean sprouts but they just won’t hold up for 4 days. Next you’re going to grill your chicken. I actually used my old school George Foreman grill and they were ready in just 5 minutes. If you have an outdoor grill, they may take 5 minutes per side. Another perk of using chicken thighs: they are hard to overcook! Allow your chicken to rest, slice into strips, and add to your veggies. You can toss everything in the vinaigrette right away, or wait until you serve. Your choice! These satay chicken meal prep lunch bowls are perfect for summer in so many ways: no oven means your house stays cool, low carb to keep things light, and full of tropical satay flavor, so you can feel like you got to go somewhere exotic, even if you are stuck at home. 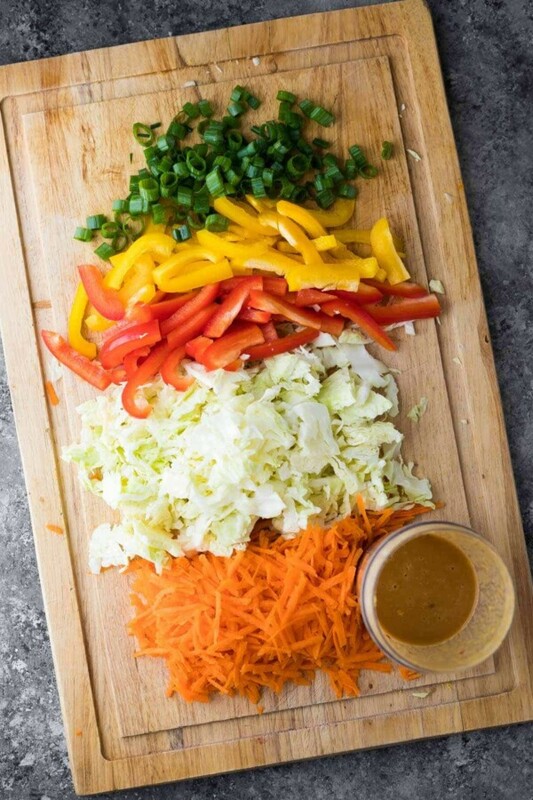 Stir together all marinade/dressing ingredients. Remove ⅓ cup and add to a small dish along with the chicken thighs. Allow to marinate for at least 30 minutes (up to 24 hours). 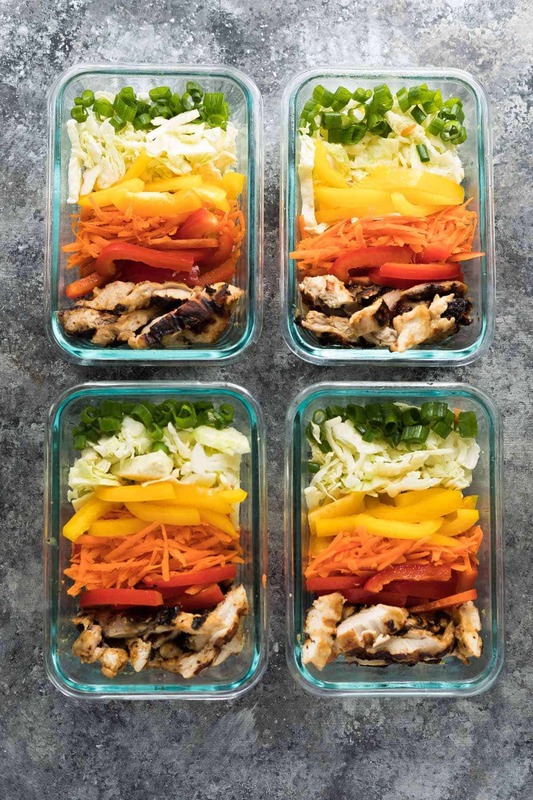 While chicken is marinating, prepare the veggies and divide evenly between 4 2 cup capacity storage containers. To cook chicken:Heat an outdoor grill over medium-high heat. Spray with oil to prevent sticking. Grill chicken thighs for 5 minutes per side, until cooked through. Alternatively, pre-heat a George Foreman grill for 5 minutes, then grill chicken thighs for 5 minutes total or until cooked through. Allow chicken to rest for 5 minutes before slicing and adding to the storage containers. To serve:Either dress the salad ahead of time or right before serving. Enjoy cold. The vinaigrette is heavy on the ginger, if you don't like a strong ginger flavor, cut it back. je voudrais savoir ou trouver vs boites pour mettre le repas ? I made this for my lunch today and it was SO good! Will definitely be making again! I used bagged coleslaw mix to make things quick & easy and also used honey & sriracha in the sauce instead of brown sugar & red pepper flakes (just based on what I had on hand) and it was delicious! Will def be trying some of your other meal prep ideas soon!